Everlast with Nike Grind roll goods mean easy and fast installation and a virtually seamless appearance. Everlast Rolls and Tiles come in 35 standard colors. In addition, Everlast’s custom color and logo capabilities ensure limitless design options. The Everlast with Nike Grind zone color classification system divides patterns into six color-coded zones based upon color intensity and price points. The zone system makes determining color specifications and finding the perfect pattern an easy and efficient process. Designed with a patented "Ultra" wear layer to provide unlimited design options, Everlast UltraTile offers a new brand of visual excitement to any fitness facility or club interior. The modular 2’ x 2’ x 1” tiles can be placed over your existing floor, saving time and money. UltraTile is easier and faster to install than traditional glue down floors because no adhesive is needed. In addition, the unique dowel rod fastening system gives you the ability to quickly move or replace tiles as desired. Everlast Performance is a premier sports flooring product ideal for multi-purpose areas, indoor tracks, gymnasiums, aerobic centers, and court surfaces. The multi-layer product provides high performance and superior durability and delivers bold and energetic design to any facility. Performance is created by fusion-bonding a 3mm ECORE recycled rubber wear layer to ECORE’s recycled rubber underlayment. This is achieved using ECORE’s patent-pending itstru technology. ECORE spent five years of intensive research and development to create fusion bonded itstru technology, which involves fusing the flooring’s wear layer to an underlayment comprised of up to 91-percent post-consumer recycled rubber. ECORE’s Terf fulfills a need in the marketplace for a revolutionary, premium turf product. It provides cushion underfoot, has sound isolating advantages, and adds a significant environmental story that does not exist with any other turf product. Terf was designed with an athlete’s body in mind. Of particular importance is force reduction, which measures and evaluates a flooring system’s ability to reduce impact, especially to the lower extremities. 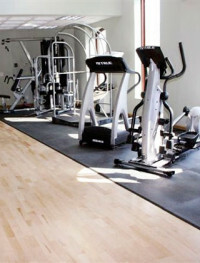 SuperSport™ is Humane's premier line of fitness matting specifically designed to protect your floor and fitness equipment. It is constructed of the same quality materials utilized in our Guardian Flooring Systems and offers the same benefits that hundreds of facilities rely on worldwide. Shok-Lok™ is the newest line of fitness mats from Humane Manufacturing, and helps alleviate the problem of noise and vibration in a fitness room. The Shok-Lok system of mats utilizes a special design which significantly reduces the amount of vibration and noise that is transferred from the fitness equipment to the floor. This is a great addition to any facility and can be used even on existing floor systems to reduce noise and vibration. Available sizes: 4’ x 8’ Equipment mat for Cardio pieces, 2’ x 2’ interlocking tiles.